Carnations add color to landscapes. Once the carnations produce blooms, you can harvest the seeds to grow new flowers next year. Gardeners often remove the dead or dying blooms from the flowers to encourage more blooms, but resisting deadheading the flowers will allow you to harvest the seeds. Once you harvest the seeds, they need to be stored properly to keep the moisture away from the seeds. Moisture can cause the seeds to mold and rot, which will ruin the seeds. Carnations grow in various colors including green, yellow, white, red and pink. Select healthy carnations from the garden to harvest the seeds. Choosing healthy carnations will ensure that you have viable seeds. 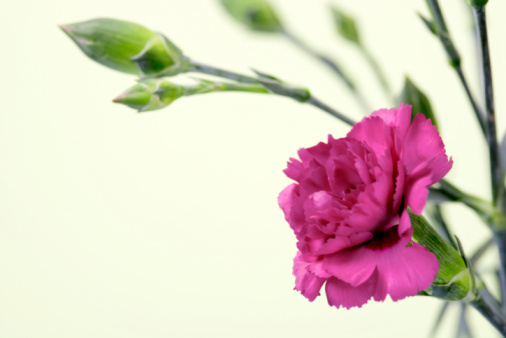 Open a small paper bag and place it around the carnation flower head. Tie the bag around the flower with string to keep insects from eating the seeds. Let the carnation flowers die back completely. The flowers will turn brown in color and feel dry to the touch. Cut the carnation flower from the plant with scissors. Spread newspapers on a flat surface and remove the flower head from the paper bag. Roll the flower head between your hands carefully to remove the seeds. The tiny black seeds will fall onto the newspaper. Discard the leaf and petals. Spread the seeds out in a single layer. Allow them to dry for two to three days. You can move the seeds outdoors in a shady and dry location away from the wind to help expedite drying. Store the carnation seeds in a paper envelope. Place the envelope inside a glass jar and seal it tightly. Write the contents and date on the jar and store it in a dark location until the next planting season.